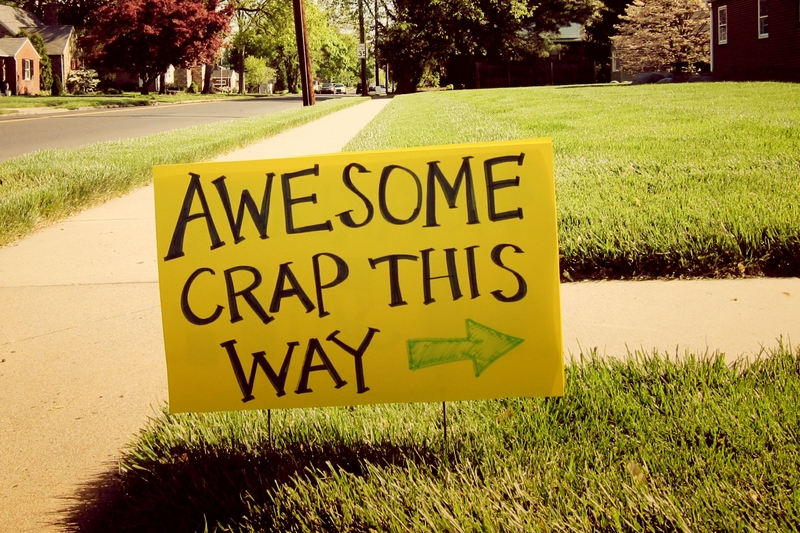 “Awesome Crap Sale” was the sign our neighbors (Jeff & Marie) erected to announce their garage sale last weekend. 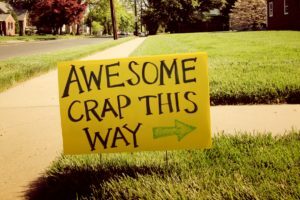 I figured this was a real can’t-miss-event, so I ambled over to see how awesome their crap really was. “I didn’t know people still slept on them,” I mused. I looked at him with a question mark on my face, “Gosh, Ron,” he whined, “I paid $650 for it a few years ago.” He was still whispering. “Jeff, why are you whispering?” I whispered back. First of all, remember that some bargains aren’t bargains no matter how cheap they are. It doesn’t matter that you paid $800 only a few years ago for that Panasonic 33” TV with all the bells and whistles. It doesn’t even matter if you still have the original remote control and it has fresh batteries in it. Why would I pay you $35 for a television set that even the Goodwill won’t accept? And don’t try the “it’s an antique” sales pitch. It is not an antique – it’s obsolete. The same goes for those VCR tapes, your old bowling ball, and that 2017 calendar from Jamaica (But it has such pretty pictures on it!). Another thing – separate your stuff into men’s, women’s, and children’s stuff. I don’t like to look through a box of miscellaneous hardware and have to fight off a bunch of dusty Avon bottles. When I’m searching for a tool, I don’t want to find a bottle of anti-wrinkle cream made from green tea extract. Also, while I’m poking around your “awesome crap,” don’t stare at me as if you recognize me from America’s Most Wanted. I’m not the guy. I’m just someone with too little money and too much time. Notice that after the sale was over, what was left was junk. I guess he sold all his awesome crap. ← Do You Always Travel With Batman?